← Happy Valentine’s Day from Car Free Days! Saturday was a beautiful sunnyish day in Seattle. The kind of day that makes you look forward to spring. The boys were off doing manly things so the seven-year-old and I had an impromptu girls day. I’m often accused of not being fancy enough for my daughter so I let her dress me that day – she was very excited that I wore something other than jeans. We decided Fremont would be a good destination for lunch and a little girlie time so we headed down the Burke-Gilman trail—my daughter riding side saddle and looking demure on the back of the Xtracycle. I was pleasantly surprised that we weren’t the only ones not racing down the trail decked out in Lycra—there were plenty of folks dressed in regular clothes using their bike to get where they needed to go. Right on. It’s also home to a rocket and a statue of Lenin. Since I’ve either lived in or frequented Fremont for years, all of those things have blended in for me; I don’t even notice them anymore. But my daughter noticed them right away. Aren’t kids great? They don’t let you take anything for granted. We read all of the information signs and took a few pictures. By that time we were starving, so we set out looking for some food. We settled on burgers and onion rings (nutritious!) at Dad Watson’s. 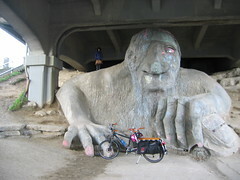 After our leisurely lunch, we rode up to the Troll to check it out. I ignored the garbage, broken glass and homeless guy sleeping under the bridge and let my daughter climb around for awhile and pretend she was scared of the troll. It’s fun to be a tourist in your own city. Good times. Since we were in the neighborhood, we decided to ride down and check out the Dutch Bike Company. I had wanted to visit the shop for awhile. I have ridden by countless times and I read their blog regularly. I’ve often recommended the shop to folks looking for an upright non-racing bike, but I’d never actually been inside. (Like many new businesses, they’ve suffered from rather funky hours, but that should be resolved come March when they move to more business-normal hours). We met and chatted with Stephan and David, rode a bakfiets around the block and took a spin on the conference bike. It’s refreshing to connect with people who share our philosophy about bikes, etc—sometimes we look around at all the cars and Walmart shoppers and wonder where our people are. It turns out they are just a bike ride (or blog post) away. 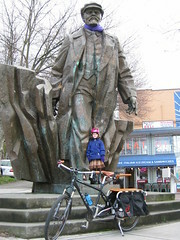 We rode back home down the trail—with a pit stop at Cowen park so my daughter could play for a bit. When we got home, I couldn’t stop talking about our fun day—I think the boys were jealous. 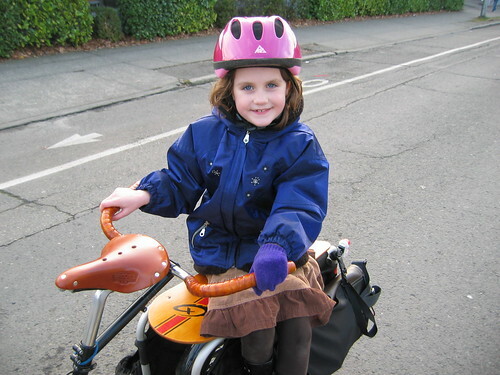 This entry was posted in alternative transportation, bikes, Burke-Gilman Trail, extravehicular activities, kids, neighborhoods, seattle and tagged bakfiets, bikes, conference bike, Dutch Bike Co, Fremont, seattle, xtracycle. Bookmark the permalink. Hey that Dutch bike company sounds interesting. Maybe that idea to buy a community bike isn’t so bad. I bet the shop needs some business and you’d be putting one of those bikes on the road for all to see. hello there! 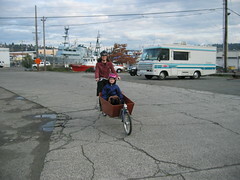 That was my husband and daughter on the conference bike with you! We are blogging about being at the Dutch Bike Co. too! They are fantastic people, and we just love the Bakfiets! The Dutch Bike Co. is very cool. They said they sell locally but they also do a lot of shipping. I’m pretty sure they’ll even ship to Australia! Laura – Thanks for the comment. We had a great day on Saturday. Testing out the bikes topped it all off. 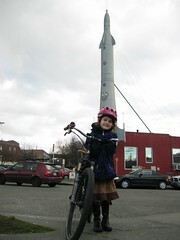 If you haven’t sent that first picture to http://copenhagengirlsonbikes.blogspot.com/ yet, do it now! Tres chic! I agree, Val. I should have grabbed a shot of both of the well-dressed ladies as they rolled home Saturday evening. Wowsa! RKT: Front bar is the Nitto Albatross. The rear bar is similar – it’s the Nitto dove or “sweptback.” Both are very similar. The second is cheaper and alloy, but not as strong. IIRC, it also won’t take bar end shifters, either. Think if it as it’s “cruiser” grade vs. Mt. bike grade — perfectly fine for the stoker position. – It allows more comfortable one-handed lounging (for eating or whatever).